Gearing Up for 4K Production, Part 3: Storage, Throughput, Switching, and Delivery – Vancouver Video Production Company – Shawn Lam Video Inc.
Two big issues that concern almost everyone making the jump to 4K and UltraHD are throughput and storage. How are you going to manage and transfer all those additional bits? Two big issues that concern almost everyone making the jump to 4K and UltraHD are throughput and storage. In the real-time atmosphere of live production, how are you going to move around all those extra bits you’re capturing in an image roughly 4 times the size of an HD image, and where are you going to store them? And when it comes to postproduction, are your current computer system, GPU, and NLE really 4K-ready? As far as storage goes, we’re dealing with essentially the same math we were before, albeit with bigger numbers in most cases. It all comes down to translating the megabit-based bit rates we use to describe video acquisition to the megabyte-, gigabit-, gigabyte-, and terabyte-based capacities we associate with throughput and storage. For example, if you’re looking at about 25 megabits per second (Mbps), a common bit rate for AVCHD, that translates to about 12 gigabytes (GB) per hour. If your 4K/UltraHD bit rate is 100 megabits per second, you’ll need roughly 4 times as much capacity, or roughly 48 GB per hour of video. Storage requirements are something you definitely want to be paying attention to. Hard drive and SSD speed are important as well. Let’s look at a practical example. The Sony 4096×2160 60p XAVC codec for UHD video has a maximum bit rate of 600 Mbps. That’s 24 times higher than the AVCHD codec I work with for HD video. When I looked at the Sony Z100 camera that used that codec, my question was, could I handle that in my existing acquisition/recording workflow? 600 megabits per second is only 75 megabytes per second. Given that a regular SATA hard drive can usually support up to 100 megabytes per second, the answer is yes. If you have a 100MB/sec SATA hard drive installed in your computer, you can edit in 4K on that drive. You don’t need to upgrade your hard drive to start working in UHD. Once you start moving into multiple camera angles, then that requirement becomes higher–at least for 600Mbps acquisition. Keep in mind that 600Mbps is the highest bit rate available for the XAVC codec. As with AVCHD, you can record in several other bit rates with the XAVC codec, all of them lower than 600Mbps. What happens when you move into a faster arena? There are some higher-bit rate codecs that available for UHD acquisition. 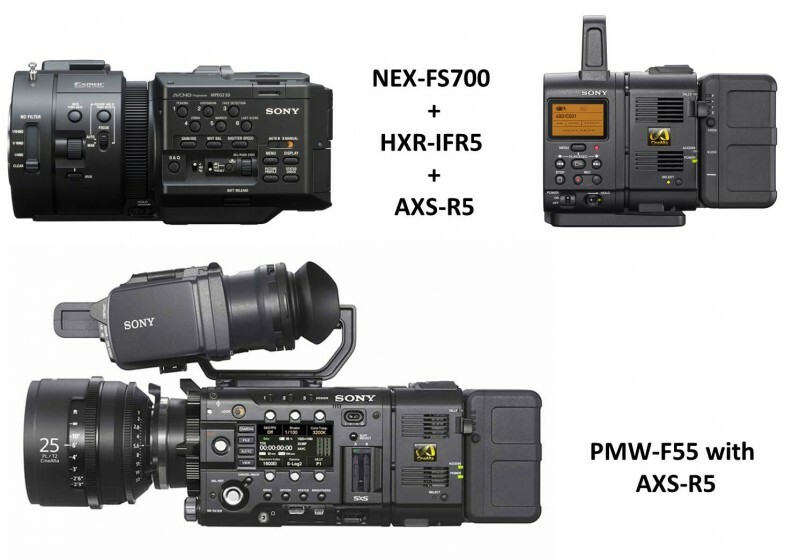 With Sony’s FS700 or F55 and the HXR-IFR5 interface unit and AXS-R5 recorder (Figure 1, below), you can acquire RAW 2K or 4K video at a bit rate of 2.4 gigabits per second (Gbps) or 300 MD/sec.